The first step is to test your water. The PH should be between 7.2 and 7.8. If itʼs not in that range, you need to add either a pH increaser or decreaser. Make sure to add exactly the amount instructed on the bottle. PH is measured on a scale of 0 to 14. Zero to seven is acidic, seven is neutral, and eight to fourteen is considered basic. In Hot Tubs 7.5 is Ideal. PH is not a normal scale like inches on a ruler. Rulers are divided into single inches whereas on the PH scale of 0-14, a value of 8 is 10 times greater than a value of 7! So itʼs a BIG deal if your PH is off even just a little bit. The amount of PH increaser or decreaser required can be very deceptive. For example raising PH from a 7.3 to a 7.5 requires a half ounce per 100 gallons using Brilliance for Spas PH increaser. Whereas going from a 7.1 or lower will require 1.5 ounces per 100 gallons. Allow 20 minutes for it to circulate in the water and retest. Additional treatments may be required to reach the ideal range. The proper total alkalinity range for spa water is 80-120 ppm (parts per million). The Alkalinity needs to be increased with a specific alkalinity increaser, where as it can be lowered by using PH decreaser. 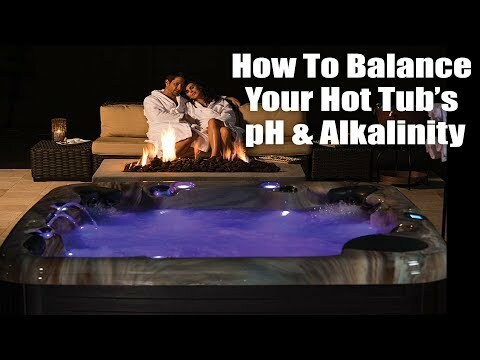 A proper PH balance is the key to controlling the clarity of your hot tubs water. pH is extremely important! If imbalanced, it can cause chlorine and bromine to be less effective. Which could lead to many sanitation issues. pH imbalance can lead to cloudy water(High pH is the most common cause of cloudy hot tub water), corrosion, staining, and even serious damage to the hot tub itself. 2)The water in the hot tub needs to be changed. This can be caused by many different things ranging from high bather loads to natural mineral buildups over time. It usually a good practice to change out the water ever 4-6 months. pH Decreaser: Lowers spa water pH levels. Lowers Alkalinity Levels. Alkalinity Increaser: Raises spa water total alkalinity levels.